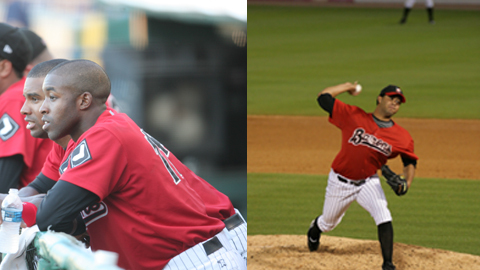 John Shelby III and Jhonny Nunez return to the Barons in 2010. The Birmingham Barons, Double A Affiliate of the Chicago White Sox, announced their 2010 roster on Monday. The back-to-back first-half champions of the South Division will rely on a strong pitching staff, a few familiar bats and one top-10 prospect in its quest for a third-straight playoff appearance. Of the 24 players on the Barons roster, eight pitchers and five hitters contributed to last season's 92-47 squad. The pitching staff will be led by veteran Matt Long. A former second-round draft pick out of Miami (OH) University in 2006, Long flourished in 2009 after being moved to the starting rotation in the second half. In eight second-half starts, Long went 5-2 with a 2.53 ERA and finished the season 6-3 with a 2.98 ERA for the Barons. Southern League Mid-season All-Star selection, Jhonny Nunez will also return to the Barons as a starting pitcher. Originally selected to play in 2009 Southern League All-Star Game, Nunez was scratched from the game after earning a promotion to Charlotte in early July. Nunez would ultimately make his Major League debut with the White Sox on August 2 and would appear in two games for the big league club, posting no record with a 9.53 ERA in seven appearances. This will mark Nunez's second season in the Chicago AL organization after being acquired from the Yankees in the Nick Swisher trade on November 13, 2008. He was 3-0 with a 2.14 ERA out of the Barons pen last season. Ricky Brooks (3-1, 2.68 ERA, 1 save), Johnnie Lowe (0-4, 9.25), Henry Mabee (2-2, 3.34, 1), Kyle McCulloch (9-9, 4.58, 1), Charlie Shirek (6-4, 3.39) and Miguel Socolovich (1-0, 0.00) will all return to the Barons in 2010. Brent Morel, the top prospect on the Barons roster and the fourth overall in the White Sox system, headlines the hitters. A third round draft selection in June 2008, Morel has emerged as the White Sox third baseman of the future, according to Baseball America. In his first full professional season, Morel hit .281 while clubbing 16 home runs and 33 doubles for Winston-Salem Dash. He also knocked in 79 runs. Morel also led the Arizona Fall League with a .435 batting average and finished fifth with a .456 on-base percentage despite being a late addition to the roster following an injury to former Barons third baseman, Dayan Viciedo. Hoover resident, Greg Paiml will join Morel on the left side of the infield in 2010. The former University of Alabama standout hit .238 with 4 home runs and 46 RBI for Winston-Salem in 2009. Paiml is a 2003 graduate of Hoover High School and was named the Birmingham New All-Metro Player of the Year his senior season while also being selected to the publication's 6A All-State Team. He served as a Barons' batboy, a clubhouse assistant and worked as a member of the grounds crew while in high school. Cole Armstrong will assume the catching duties for the Barons in 2008. Armstrong helped guide the Barons to a 2008 first-half championship when he hit .252 with 6 home runs and 31 RBI before a mid-season promotion placed him in Charloote. The 26-year old native of Canada nearly duplicated those numbers for Charlotte in 2009, hitting .252 with 10 home runs and 31 RBI. Lee Cruz (.256, 6 home runs, 36 RBI), Jim Gallagher (.280, 2, 20), Christian Marrero (.301, 11, 40), Jared Price (.220, 5, 17) and John Shelby III (.243, 10, 49) will return to the Barons in 2010. The Barons will kick off their 2010 campaign on Thursday, April 8 when the Carolina Mudcats visit Regions Park. Game time is scheduled for 7:05 PM. For tickets you can contact the Barons at 988-3200, online at barons.com, or by visiting the Regions Park Box Office.